January 2000 - ToonUps begins as an exploration of innovative business opportunities at the intersection of positive messages, uplifting entertainment, and the newly emergent worlds of the Internet and e-commerce. Winter 2000 - Massive research and development phase undertaken around business training and cartoon animation. Summer 2000 - Nationwide market research and focus groups on product usability. 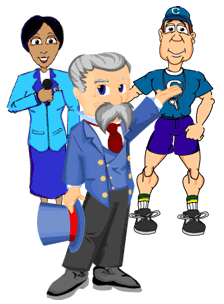 2003 - A bevy of product enhancements released, including Trainers Toolbox and Salezemail. 2006 - International e-commerce launch and business process patent received for ToonUps. 2007 - Training Quizzes and Customizable Quizmaker released. 2009 - New product, ToonUp Snippets, launched to bring a positive and fun spin to Powerpoints presentations. Winter 2010 - Beta Launch of A Better World, a unique Facebook game "Where All Good Deeds Get Rewarded!"